Just in time to begin spring lawn care, the new WORX® 40V, MAX Lithium, 20 in. Lawnmower is the latest addition to the brand’s line of high efficiency, low maintenance, easy to operate and eco-friendly lawn mowers. This largest mower in the WORX 20V Power Share platform features a wider deck than its predecessors to save time and labor, as well as higher voltage for added torque and cutting power. Unlike gas models, the 40V mower has no cord to pull, choke to adjust, oil level to check, air and gas filters to replace or gasoline container that needs refilling. Not to mention the rising costs of gas and oil, as well as the expense of annual tune-ups. The only maintenance requirements of the cordless mower are periodically sharpening or changing the mulching blade, cleaning the underside of the mower’s deck and charging or storing the removable batteries. This hassle-free, cordless mower features two-step electric starting. Just hold down the start button, then squeeze the bale handle and the walk-behind, push mower is up and running. The mower’s 3-in-1 deck allows users to mulch, bag, or side-discharge grass clippings. The steel, 20 in. deck is equipped with 10 in. rear wheels that provide excellent traction, mobility and maneuverability around trees, shrubs, flower beds and other lawn features. When mulching, the mower’s Nutricut™ multi-cut blade action cuts grass into fine particles, returning them to the soil for fertilization. Besides its mulching capabilities, the mower’s rugged, steel deck is highly impact resistant and built to withstand years of hard use over various terrains. Neighbors appreciate the 40V mower’s significant noise reduction, compared to gas models. The green machine also is independent of fossil fuels and adds no emissions to the environment. The cordless mower features single-lever deck height adjustment to raise or lower the mower deck from 1½ to 4¼ in. Easy adjustability enables homeowners to quickly set the right mowing height for the season, type of grass and growing conditions. Selecting the proper mowing height helps grow a low-maintenance, drought-tolerant lawn, while discouraging weeds and undesirable grasses. The ergonomically designed mower includes a foam-padded comfort handle that’s fully collapsible for compact, stand-up storage. Its 1.4 bushel-capacity, rear grass bag includes a carrying handle for easy emptying. Batteries are removable from the mower deck for charging or storage. The mower’s 20V, MAX Lithium, 5.0 Ah batteries are part of the WORX 20V Power Share program and are compatible with other WORX lawn and garden tools. Standard equipment includes two 20V, MAX Lithium, 5.0 Ah MAX batteries; dual-port, 2-1/2-hour charger with battery power-level indicators; mulch insert plug; and rear grass bag. 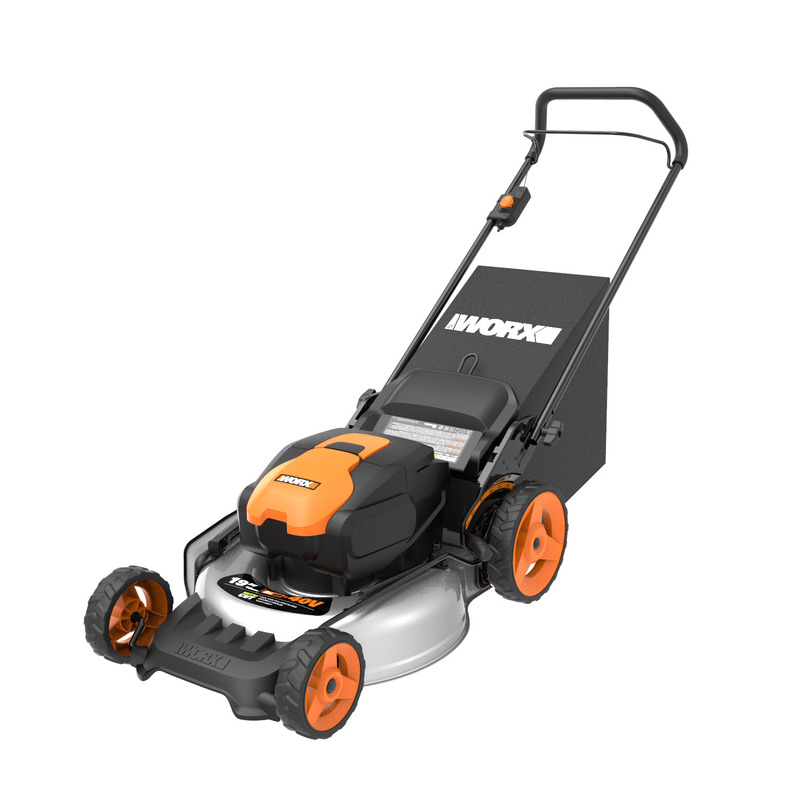 The WORX 40V, MAX Lithium, 20 in., Lawnmower (WG751, $474.99) is available at https://www.worx.com/en_CA/. It is covered by the WORX three-year limited warranty.